Visit Siauliai – a forth largest city in Lithuania. Siauliai became a town in 11th century and later on was named after a famous Sun Battle. Usually, Siauliai city is called the city of Sun. If you are wondering what to see in Siauliai, believe us – there are many things worth touring while visiting Siauliai city. Travel to historical monument and folk art ensemble – The Hill of crosses. What an excitement! We have been waiting for this moment… And finally, you decided to hit the road and travel to Vilnius! Great decision, this will be a travel you will never forget! Ready for Vilnius city tour? Places to visit in Vilnius are always spreading it’s magical spells. Wanna take a look at amazing city panorama? Tour to the Gediminas Castle Hill. Interested in arts? Visit bohemian district Uzupis Republic and read Uzupis Constitution in 24 unique languages! They call it a collection of legends, motherland of grand dukes, bridge to Lithuania and even symbol of Lithuanian tourism… Sounds like a mystery, right? It is a good reason to start your travel, visit Trakai and decide, which of these descriptions truly match Trakai tourism character. This tiny town is situated in eye-popping lakeside area, which is perfect for boat tours and hot air balloon flights. Let’s travel to the seaside and get acquainted with Palanga tourism attractions! They say traveling brings love and power back to people lifes. If it’s really like that, Palanga tours will give you more than that… Imagine calm and warm sea, wind blowing, feel all of the sunbeams kissing your body. This is how Palanga feels like, this is the atmosphere. Travel around Lithuania and prepare to visit Klaipeda – the oldest city of the country. Start your tour with our friendly Klaipeda tourism geeks, they know exactly what travellers need! No doubt that Klaipeda tours will reveal few interesting facts. Strange, but long time ago the city was called Memel. For those who don’t know the town is situated just by the shores of the Baltic Sea and it owns an important seaport. Are you ready for a compelling tour to Druskininkai resort? For sure! Perfect for hot summers, windy autumn, for freezing winters and, of course, sparkling springs! Trust on Druskininkai travel guide, it will be a pleasure to tour you around! Flower gardens, parks, lakes, rivers, beautiful forests… Druskininkai travel guide is creating a temptation to feel the spirit of this Holy nature! Travel around Kaunas – visit this vibrant city full of surprises! Shall we begin? Some people say, that Kaunas old town is like anincredible collection of the best Kaunas highlights. Kaunas tourism guideswill emphasize, that from 20s to 30s Kaunas was Lithuania’s capital. History has to be told, so you will hear stories from medieval grand dukes to 20th century freedom fighters. Are you ready to visit Vilnius? What an excitement! Have you ever thought about holidays in Vilnius? We have been waiting for this moment for ages! And finally, you have decided to grab that tour package & hit the road for your travel to Vilnius! Great decision, this will be a trip you will never forget! Ready for Vilnius tours? Traveling to Vilnius on your holidays is going to be a trip, full of interesting sightseeing places and led by passionate travel guides. Places to visit in Vilnius are always spreading its magic spells. There are plenty tours in Vilnius, so it is going to be an extraordinary adventure for you and a group of friends you are traveling with. Ready for a tour in Vilnius? Would you like to take a look at amazing city panorama? Vilnius tour will create a chance to experience time on the legendary Gediminas Castle Hill. Interested in arts? Visit the bohemian district of Uzupis Republic and read Uzupis Constitution in 24 unique languages! Thirsty? While visiting Vilnius, explore IN VINO winery! Consider yourself as an astronomy geek? Take a tour in Planetarium! Vilnius tour attractions are already going crazy about you… Are you going crazy about Vilnius city tours? Hope so! During your holidays in Vilnius, you will be able to experience a lot: from food and places, to history and architecture. Travel to Vilnius and explore one of the most delightful capitals of the Baltics! Vilnius travel guide, events and Vilnius tours won’t let you sit at home. It’s about to be sightseeing based holidays. Pick one of our holiday tour packages and visit Vilnius with a group for a reasonable price. Grab additional, optional tours for low cost – you won’t regret it – traveling to Vilnius will seem like a burst of magic! Film festivals, exhibitions, concerts and variety of performances won’t let you wonder “what to see in Vilnius”. Our professional Vilnius travel guides will take care of your plans! Visit Vilnius and don’t miss your chance to talk with friendly locals. Grab one of our engaging Vilnius city tour options, get inspired by Vilnius attractions. Find your own and exclusive way to explore and visit Vilnius – one of the most brilliant destinations. So, have you found out what to see in Vilnius? Travel around Lithuania, visit Vilnius and we will talk more about it. The Old Town is one of the largest medieval old towns in Northern Europe and its crisscrossed narrow streets, beautiful courtyards, many churches and other architectural monuments will no doubt make you fall in love with the city and its vibrant atmosphere. However, the Old Town is among highly recommended places to visit not only because of its rich history and architecture but also the many cozy and unique cafes, restaurants and shops. Vilnius Cathedral Basilica is the heart of Catholic religious life in Vilnius. Apart from proudly standing at the very center and core of the city’s old town, the famous Cathedral also has crypts and catacombs inside where many famous people from Lithuania and Poland history are buried. The Vilnius Cathedral Basilica is also a place for the main Christian and national festivities in Vilnius and has a bell tower besides it offering a beautiful panorama once you reach the top. Užupis is one of the most vibrant, Bohemian and artistic neighbourhoods in Vilnius. The district is a self-proclaimed independent republic and has its own anthem, constitution, president and traditions. Due to its bohemian atmosphere, sculptures and art the Republic of Užupis is compared to the Freetown Christiania in Copenhagen and even Montmartre in Paris. Don’t want to miss seeing such a cool place, do you? Church of St. Anne is a masterpiece of late Gothic architecture in Vilnius, which is said to have impressed Napoleon Bonaparte so much that he wanted to bring it back to Paris in the palm of his hand. It is one of the most beautiful and unique places in Vilnius because of the many arches, elegant metal gates expressive towers and many other astonishing details. So it should definitely be a must-see place in Vilnius! Vilnius University, founded in the 16th century, is one of the oldest and most beautiful university in Central Europe. Thirteen internal courtyards feature Baroque, Gothic and Classical styles of architecture and even has a church of St. Johns and a bell tower standing in one of them. The interior with all of the impressive arcades, galleries, frescos and the main library also makes the university one of the most visited and unique places to visit in Vilnius. Forto Dvaras is definitely a top place to try and eat traditional Lithuanian food such as the famous cepelinai, kugelis and of course pink soup! It is located in Pilies street so it will surely be on your way while wandering the Old Town and the prices are not too high. Lokys, known as the hunters’ restaurant, is situated in a former merchant’s house and so offers a unique interior and atmosphere. It is both meat-lover and vegetarian friendly, offering a rich meat, fish and of course beer assortment. Pilies Kepyklėlė is a great place to have your breakfast at if you are a fan of mouthwatering omelette, savoury pancakes or poppyseed cake. If not, then you can swing by any time of the day as it is one of the best places to get fresh sweet rolls, cookies, cakes and all your sweet tooth can dream of. 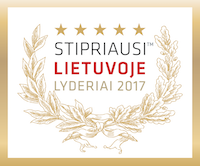 Bistro 18, a winner for TripAdvisor’s Certificate of Excellence for several years in a row, is located at the very heart of Vilnius Old Town. The restaurant offers a variety of contemporary international cuisine including both classic and more daring exotic dishes as well as a wide selection of wines. Uptown Bazaar is one of the most amazing, innovative and energetic places to eat at. Here, you can do it all: buy fresh food, order dishes varying from pizza, seafood to vegan or simply enjoy a cup of coffee or a pint a beer with your friends in the modern building. Climb to the Hill of Three Crosses if you want to witness one of the most beautiful panoramic view you have seen. It is one of the best things to do because it is free, will make you sweat all the cepelinai and kugelis out and the view will mesmerize especially during sunset. Visit the Palace of the Grand Dukes of Lithuania in order to learn more about the rich history of this famous building and of Lithuania in general. The palace also represents the evolution of architectural styles from late Gothic to the early Baroque and is just behind the Vilnius Cathedral so it is super easy to find. Take a break in the Bernardine Gardens after all the walking and sightseeing and enjoy a cup of coffee in front of a singing and dancing fountain in the heart of it. The park also features botanical and monastic expositions, children’s playground, rose gardens and much more so it is suitable and recommended for everyone. Walk beneath the Gate of Dawn because it is one of the most famous religious, pilgrimage places not only in Vilnius but also abroad. The painting of the Blessed Virgin Mary is known and copied all over the world so to visit this sacred place is definitely a thing to do and see while in Vilnius. Visit the famous churches because Vilnius is proudly full of them. Most famous churches such as All Saints Church, Bernardine Church, the Church of St. Raphael the archangel are situated in or around the Old Town so are easy to access, represent different architectural styles and most of them are free to see and take pictures of. If you’re traveling in Vilnius during the winter, don’t forget to pack some warm clothes because there always is a possibility of unexpectedly cold weather. If you want to get around the city with a taxi, don’t forget to call it beforehand since it surely will save you some money. It is highly recommended to leave tips in bars and restaurants, but the amount is up to you. Also, public drinking is a strict no-no in Lithuania, so make sure not to get in trouble and not to take a fine back home with you. Other than that, have a good trip and enjoy your time here!